The Union Oyster House is both the oldest restaurant in Boston and the oldest restaurant in continuous service in the country-its doors first opened to diners in 1826 when it was founded by Hawes Atwood. The first known public serving of oysters in the American colonies occurred when a saloon located in a New York City cellar opened in 1763. Oyster cellars—19th-century restaurants located below street level specializing in serving oysters—in New York City, Boston and Providence became gathering places for politicians and the social elite, not unlike the coffee houses of Europe. Among the oldest and best known oyster restaurants still in operation today, in addition to Union, are Antoine's Restaurant, in New Orleans, which dates from 1868, where "Oysters Rockefeller" was concocted in 1889 and the famed oyster bar at New York's Grand Central Terminal, which dates from 1913. After 87 years in business the Atwood family sold the oyster house in 1913 to the Fitzgerald family who owned the property until at least 1927. 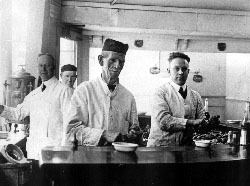 The Greaves brothers of Nova Scotia, Canada, owned the property by 1940 and began to operate satellite branches in other parts of town. The restaurant itself had been expanded in 1933 when a second floor dining room seating 50 persons opened. In 1941, the oyster house opened three new dining rooms on the second floor and installed a new kitchen and bakery with all new cooking and dishwashing equipment. The Greaves sold the restaurant in 1970 to Joseph Milano, whose family continues to run the renowned restaurant today. 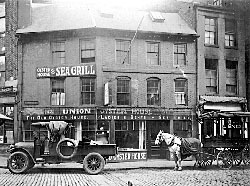 Union Oyster House consists of the original 1716-17 building and two adjoining brick row houses. However, the adjoining buildings, while dating from 1851 and 1916, were not incorporated into the restaurant until the late 20th century. The original restaurant is a five-bay, three-and-a-half story gambrel-roofed building in the Georgian style. The form of the building is unusual—the three southern most-bays face Union Street while the two northern-most bays face Marshall Street. The two facades are connected by a vertical joint line in the brick work. Prior to becoming an oyster house, the building was a private residence and later a dry goods store. The interior section of the original oyster house retains an unusually high degree of integrity. The soapstone oyster bar and stall-type booths are the only known survivors in the United States. The oyster bar is an open semi-circular oak counter with a soapstone inner shucking table and drain. However, the soapstone slab was covered with copper sheet metal by at least the 1940s, most likely to comply with health codes. 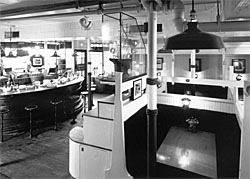 The bar is surrounded by nine stools fastened to the floor; the tops are flat wooden discs supported by cast iron poles. Famous patrons include Senator Daniel Webster who was a regular in the 1840s and 1850s; Presidents Calvin Coolidge, Franklin Roosevelt, John F. Kennedy and William J. Clinton, as well as governors, athletes, and stage and screen stars visiting Boston. In fact, booth 18 on the second floor was a favorite of President Kennedy's and was dedicated to his memory in 1977. 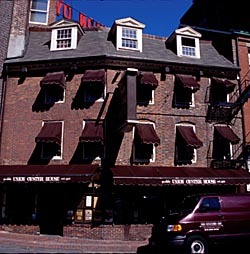 The Union Oyster House is located at 41 Union St. in Boston. It is open for business Sunday- Thursday 11:00am to 9:30pm and Friday and Saturday from 11:00am to 10:00pm. For further information call 617-227-2750 or visit the website.